Peck Drugstore Building. Date: 1874-75. Design: By Reuben Wheeler in the Italianate style for Amos Rathbone. History: The site was originally the location of a small wooden structure, a dry goods store operated by John Doornick, early merchant, with partner Paul Steketee. The wedge shaped building became the drugstore of John and Thomas Peck from New York, who both became millionaires and died in 1915 and 1916 respectively, with Thomas the victim of a sensational murder. Today: Added to the National Register of Historic Buildings in 2000, it is currently known as MoDiv, a retail incubator, home to many small commercial ventures. Old Masonic Temple. 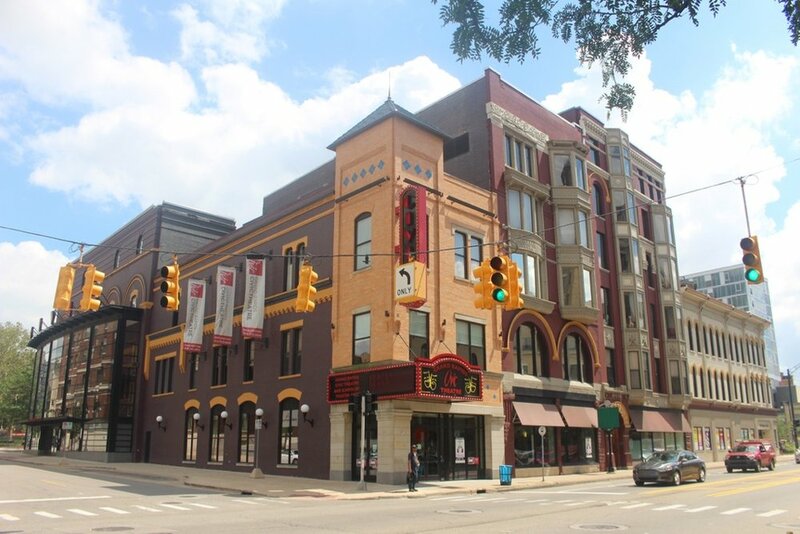 Date: 1895 Design: This large commercial building with Romanesque details was designed by architects Robinson & Campau. Details: Elaborate building details of the two-story Lodge Room where the Masons "conducted business and held ceremonies" are preserved in the 6th and 7th floor CWD offices including carved wooden balusters and columns and "glazed brick fireplace, ribbed plaster transept vaults and hand-carved wood volutes on pillars inside the CWD offices in the "lodge room" on the 6th and 7th floors." 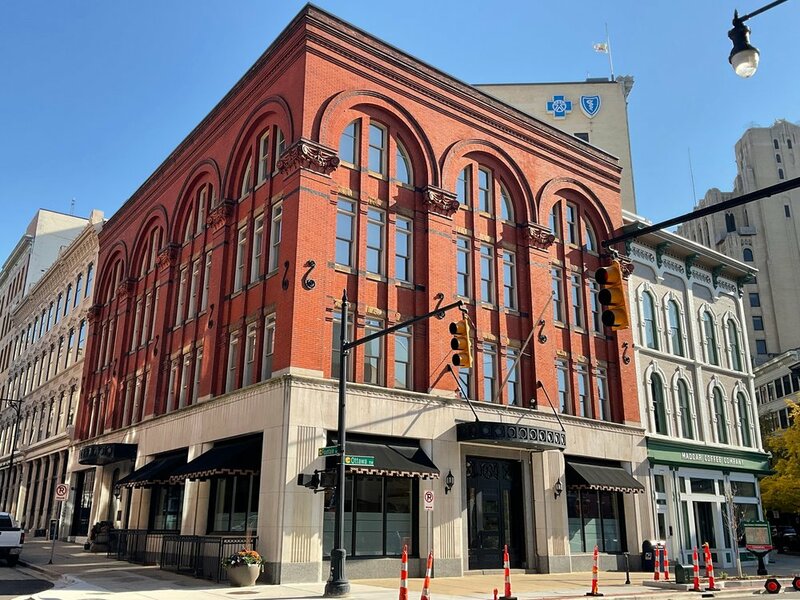 (Jim Harger, M-Live, June 3, 2014) History: Today: CWD Real Estate Development restored the historic building, preserving elaborate interior details described above and reconstructing both the interior and exterior where needed. Morton Hotel and Kent State Bank. (Former address: 72 Monroe Center NW), Date: 1922. Design: Holabird & Roche Architects, Chicago and Owens Ames Kimball, Contractors. Constructed in the neoclassical style and owned by J. Boyd Pantlind. Today: Morton House apartments. Michigan National Bank. Date: 1925. Design: Wirt Rowland, Architect, Smith Hinchman & Grylls, Detroit. 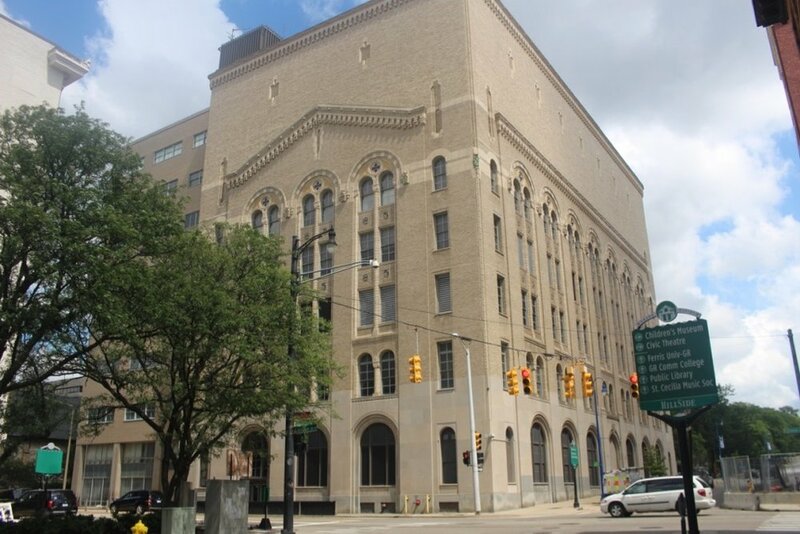 1920's modern skyscraper of Italian Renaissance styling and elaborate details, including a sculptural representative of a Native American the Monroe/Ionia corner of the facade and cast iron rosettes designed by renowned Detroit architectural sculptor Corrado Parducci. Thebuilding features large deeply recessed Romanesque arches at the base with recessed corner pylons. It rises sharply above that with the style of a modern skyscraper. The interior included walnut panelling, wrought iron railings throughout and an elaborate second-floor banking hall with marble floors, terrazzo, columns and ornate woodwork. The second floor later became a ballroom with a grand staircase. 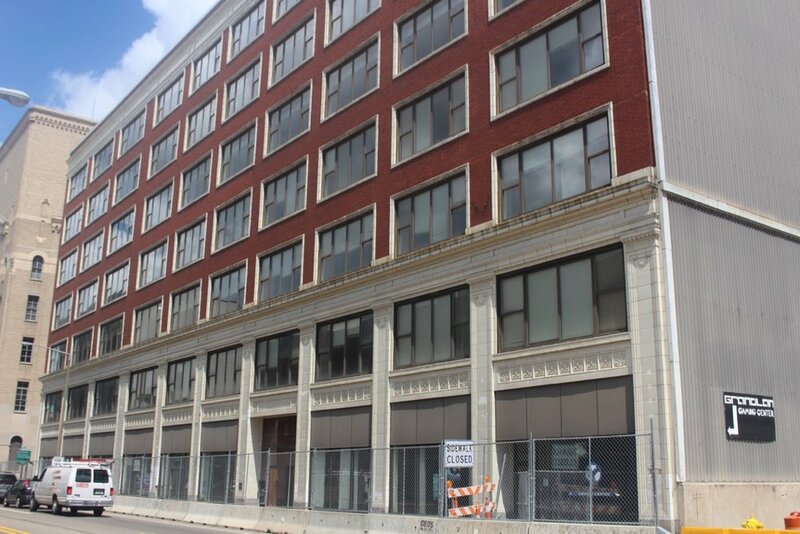 Today: Commercial office building and event space owned by City Flats Hotel next door. Paul Steketee & Sons Department Store. Date: 1916. Design: Robinson & Campau. Designed as an eight-story commercial building, History: Original dry goods store founded in 1862 by Paul Steketee, Dutch immigrant who came to the US in 1850 and paul Doornich. Today: Blue Cross Blue Shield Offices. Karl Building. Date: 1890. 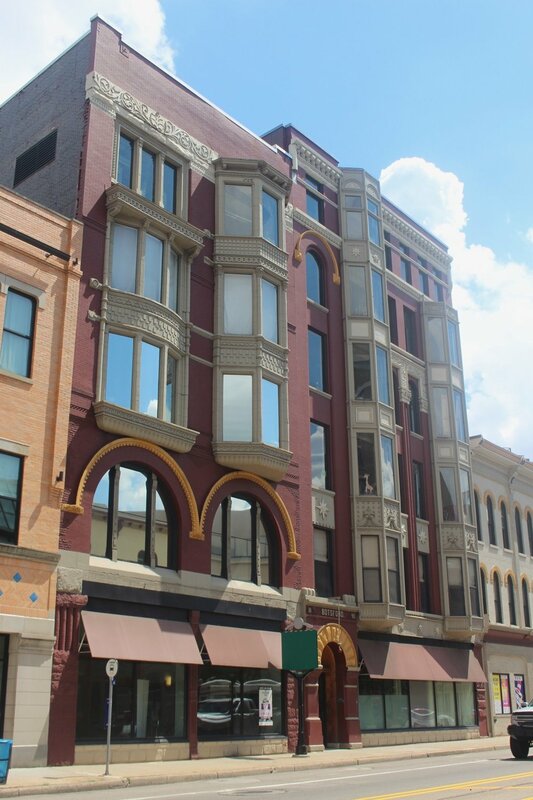 Design: Italianate style brick and limestone building typical of early Monroe Center commercial buildings. Listed in 1982 on the National Register of Historic Buildings. Today: Madcap Coffee with commercial and residential on the upper floors. Aldrich and White Block. Date: About 1874. Design: One of the few remaining early Italianate commercial blocks designed in brick with limestone details by architect John W. Grady. Today: Added to the National Historic Register in 1999, it currently houses a variety of commercial venues, offices and residential units. Flat Iron Building. Date: 1860. 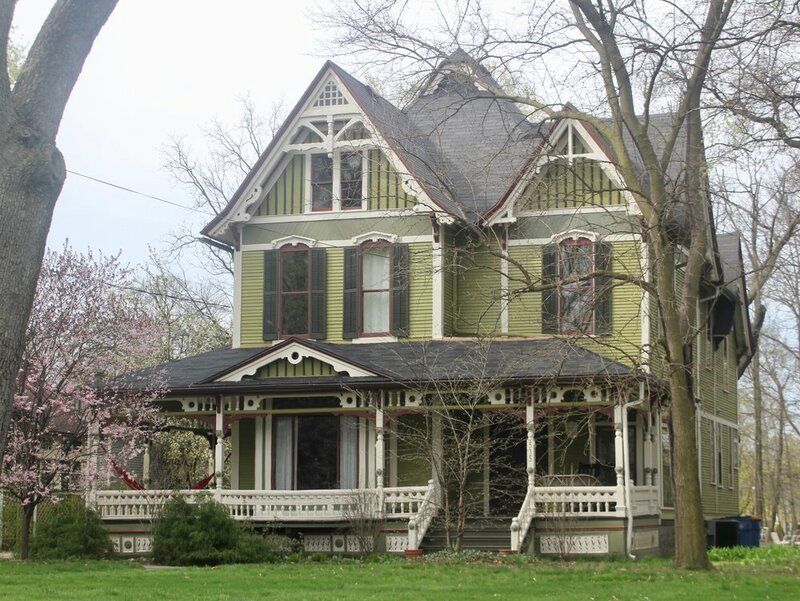 Design: Architect unknown and built for Aldrich, Mayor of the city 1868-1870. The building has the iconic bullnose shape at the corner. 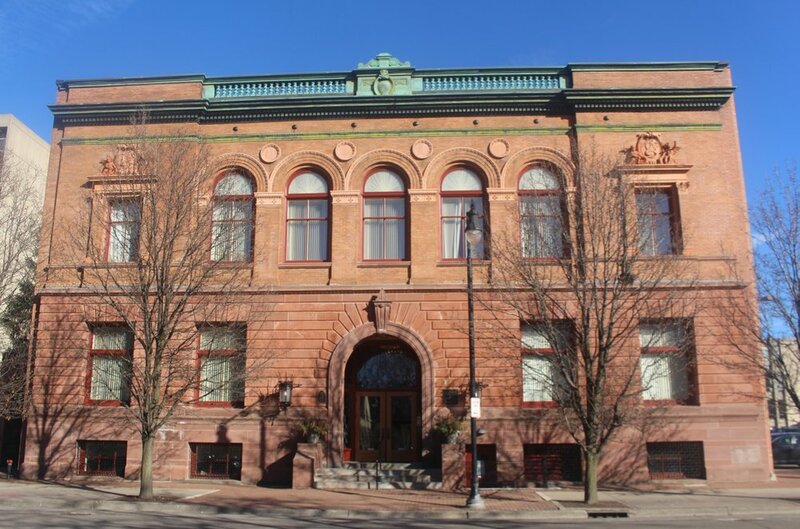 History: Second oldest commercial building originally designed to hold a bank. The upper stories of the building were vacant from the 1940's until present day. Today: Smith Haughey Rice & Roegge, Attorneys at Law. 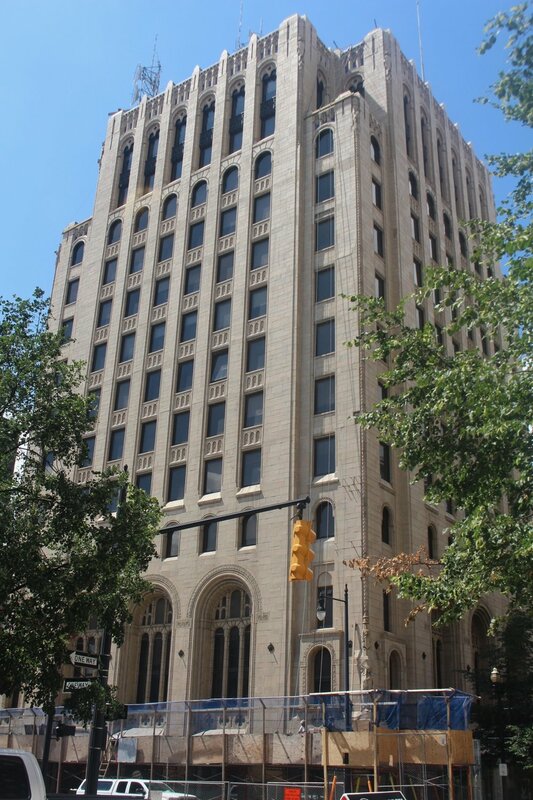 The restored Flat Iron Building is LEED certified. 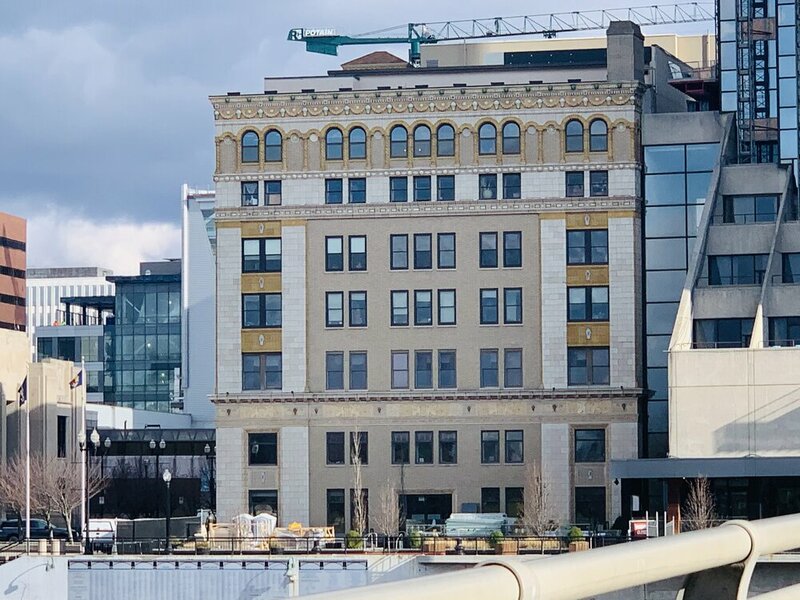 Link here to the tour of buildings on Lyon & Ottawa Streets where early commercial modern meets the mid-century and urban renewal. 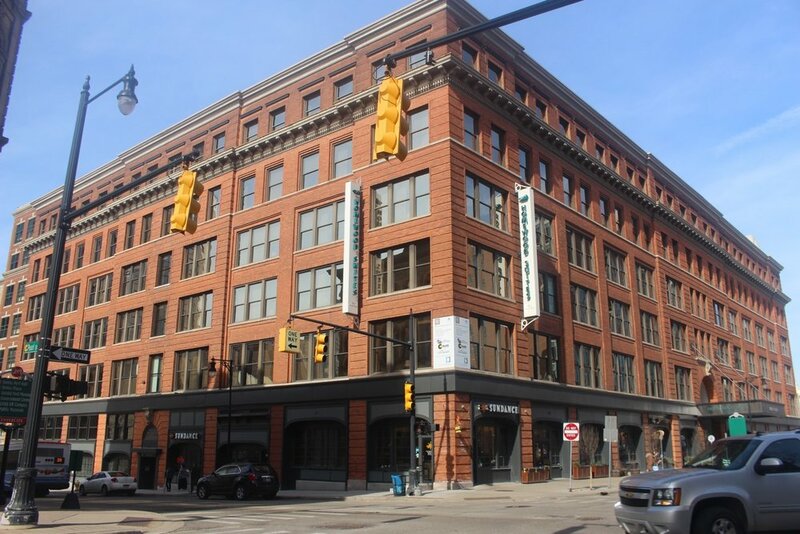 Link here to the tour of Pearl Street from Monroe to Division where classic historic styles blend with modern commercial buildings. 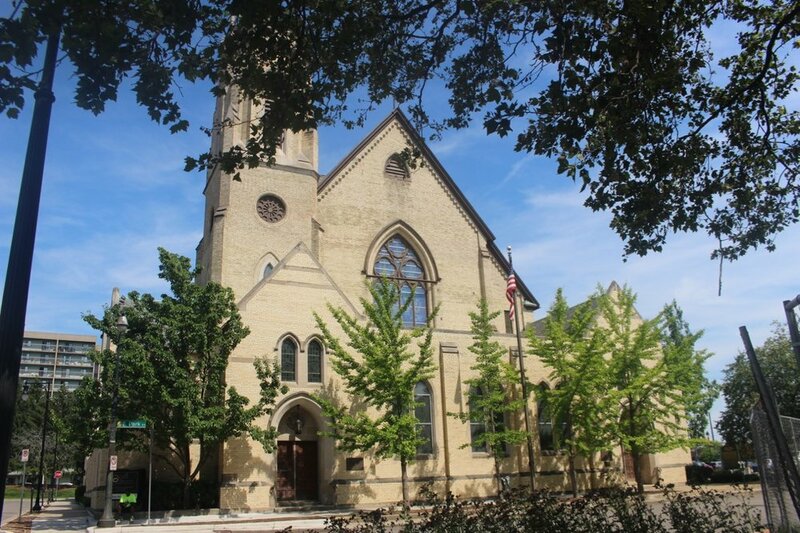 Link here to tour Fountain Street where furniture exhibition buildings mingle with college buildings and church architecture. Follow this link to tour Library Street with theatre, residential and civic spaces.